Blackened lungs, hacking coughs, wrinkled skin, heart problems, increased risk for cancer—you’ve probably heard about the many dangers of smoking before. Tobacco products, especially when used consistently, wreak havoc with your cells. What you may not consider is how smoking and feet are connected. Those negative effects in your heart, lungs, and organs can also be found in your lower limbs. Although far away from your heart and lungs, your feet are still connected to them and suffer when they are compromised. Over time, smoking severely damages your lungs, decreasing your air capacity. You’re not able to breathe or absorb oxygen as easily. Tobacco stiffens the walls of your arteries as well, creating peripheral arterial disease (PAD). Plaque builds up and narrows your blood vessels, decreasing blood flow to your extremities. The loss of healthy blood in addition to your impaired ability to take in oxygen means that significantly less of the nutrients and energy your body requires reaches your feet. This can result in foot and leg pain when you’re active and trouble recovering from sores or other small injuries. Other ways smoking and feet are connected is your increased risk for osteoporosis and Buerger’s disease. Osteoporosis is the slow, steady breakdown of your hard bone tissue. Healthy bones are able to replace old tissue. In osteoporosis, the bone is destroyed and not replaced quickly enough, thinning your skeleton and making it brittle and weak. Since your feet handle so much pressure from your body weight and the force of your steps, fragile bones increase your risk for foot fractures. Buerger’s disease affects the blood vessels, much like PAD. The walls of the vessels swell, restricting blood flow and causing clots to form. Over time, the restricted flow leads to painful feet, tissue damage, and even gangrene. These complications may require amputation to prevent life-threatening infections. Here at Absolute Foot Care Specialists, we understand how hard it is to quit smoking. The longer you’ve indulged the habit, the harder it is to break. The risks you face and the permanent damage tobacco can create in your body, however, are serious. The best way to prevent these complications, or even treat them if they’ve already arisen, is to quit. We are more than happy to help you begin this process. 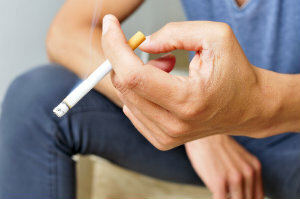 If the painful connection between smoking and feet has already affected your life, Dr. Noah Levine can still help you manage your discomfort and symptoms. Increasing your circulation, eating healthily, and accommodating your feet are all important for avoiding permanent problems and relieving pain. Our expert staff can help you establish a foot-safe exercise program that encourages healthy blood flow, so more oxygen and nutrients are able to reach your lower limbs. Eating protein, calcium, and vitamin D-rich foods combats thinning bones. Strength and resistance training also increases bone density. You may still need to make shoe adjustments or use orthotics to help support your lower limbs and avoid injuries. If conservative measures are not enough, you may need surgery to correct circulatory problems or fix fractures. Smoking can have a significant, negative impact on your feet. Quitting tobacco use is the best way to avoid painful and potentially life-threatening health issues. Don’t take your feet for granted. If you’re a smoker with painful feet, contact Absolute Foot Care Specialists here in Las Vegas for more information or an appointment. Use the online contact form or call us at (702) 839-2010 to reach our three offices.